AcelRx Pharmaceuticals Announces DSUVIA™ as Brand Name for ARX-04 in the United States | AcelRx Pharmaceuticals, Inc.
REDWOOD CITY, Calif., Jan. 8, 2017 /PRNewswire/ -- AcelRx Pharmaceuticals, Inc. (Nasdaq: ACRX), a specialty pharmaceutical company focused on the development and commercialization of innovative therapies for the treatment of moderate-to-severe acute pain, announced that the U.S. Food and Drug Administration (FDA) has conditionally accepted the brand name, DSUVIA™ (sufentanil sublingual tablet, 30 mcg), for the company's investigational product candidate, ARX-04. In addition, AcelRx has applied to the U.S. Patent and Trademark Office to obtain federal registration of the DSUVIA mark. AcelRx recently announced the submission of a New Drug Application (NDA) with the FDA for DSUVIA for the treatment of patients experiencing moderate-to-severe acute pain in a medically supervised setting. This market is comprised of the adult emergency department setting, ambulatory and outpatient surgical settings, short-stay inpatient settings and certain office settings that serve patients undergoing painful procedures. In total, based on internal market research and published national surveys, AcelRx expects the peak market for DSUVIA in the U.S. to be an estimated $1.1 billion. "Our initial target market will be the emergency medicine market," commented Gina Ford, AcelRx's vice president of commercial strategy. "Pending a favorable review by the FDA, we anticipate initiating a pilot launch program into identified centers of excellence around the country shortly after approval. During the next three quarters, we plan to add the necessary commercial staff and infrastructure to support these initial commercialization efforts." The FDA is expected to determine by mid-February 2017 whether the DSUVIA NDA is complete and acceptable for review. Should the Agency accept the NDA for review, a Prescription Drug User Fee Act (PDUFA) decision could be expected in the fourth quarter of 2017. AcelRx Pharmaceuticals, Inc. is a specialty pharmaceutical company focused on the development and commercialization of innovative therapies for the treatment of moderate-to-severe acute pain. 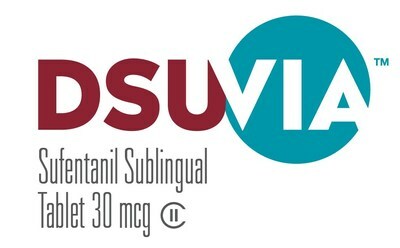 An NDA for DSUVIA (sufentanil sublingual tablet, 30mcg), known as ARX-04 outside the United States, with a proposed indication for the treatment of moderate-to-severe acute pain in medically supervised settings, was recently submitted to the FDA for review. This press release contains forward-looking statements, including, but not limited to, statements related to the process and timing of anticipated future development of AcelRx's product candidates, DSUVIATM (sufentanil sublingual tablet, 30 mcg), known as ARX-04 outside the United States, and ZALVISO (sufentanil sublingual tablet system), including U.S. Food and Drug Administration, or FDA, review of the New Drug Application, or NDA, for DSUVIA; the potential approval of the DSUVIA NDA by the FDA; the DSUVIA and ARX-04 clinical trial results; AcelRx's pathway forward towards gaining approval of ZALVISO in the U.S., including successful completion of the IAP312 clinical study for ZALVISO; and the therapeutic and commercial potential of AcelRx's product candidates, including potential market opportunities and market size for DSUVIA, ARX-04 and ZALVISO. These forward-looking statements are based on AcelRx Pharmaceuticals' current expectations and inherently involve significant risks and uncertainties. AcelRx Pharmaceuticals' actual results and timing of events could differ materially from those anticipated in such forward-looking statements, and as a result of these risks and uncertainties, which include, without limitation, risks related to AcelRx Pharmaceuticals' DSUVIA and ARX-04 development programs, including the FDA review of the DSUVIA NDA and the possibility that the FDA may dispute or interpret differently clinical results obtained from the DSUVIA Phase 3 studies; the ZALVISO development program, including successful completion of IAP312 and the resubmission of the ZALVISO NDA to the FDA; any delays or inability to obtain and maintain regulatory approval of its product candidates, including DSUVIA in the United States, ARX-04 in Europe and ZALVISO in the United States; the uncertain clinical development process; the success, cost and timing of all development activities and clinical trials; actual market size for AcelRx product candidates; and other risks detailed in the "Risk Factors" and elsewhere in AcelRx's U.S. Securities and Exchange Commission filings and reports, including its Quarterly Report on Form 10-Q filed with the SEC on November 2, 2016. AcelRx undertakes no duty or obligation to update any forward-looking statements contained in this release as a result of new information, future events or changes in its expectations.